Lincoln's Florist for over 80 years! Chambers Florists is the independent flower shop in Lincoln which creates beautiful flower arrangements to help say you care! By creating flowers for every occasion that are tailored to your individual needs, we can get you the flowers you need anywhere in the UK. From Birthdays to Wedding Flowers, we can provide you with advice and fulfil your requirements. We also would be delighted to offer a free, no obligation quote for all of your floral wedding requirements. Please contact us to arrange an appointment. 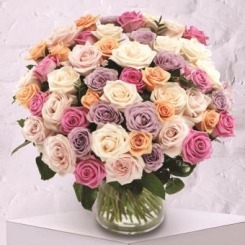 A breath-taking vase arrangement of roses in soft shades. Please note that all flowers are subject to availability and substitutions may be made at the florist's discretion. 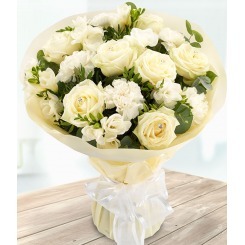 Diamonds are this month's birthstone so why not send this stunning all-white bouquet. Please note that all flowers are subject to availability and substitutions may be made at the florist's discretion.